It is convenient to access the Internet with the build-in Safari on iOS devices. 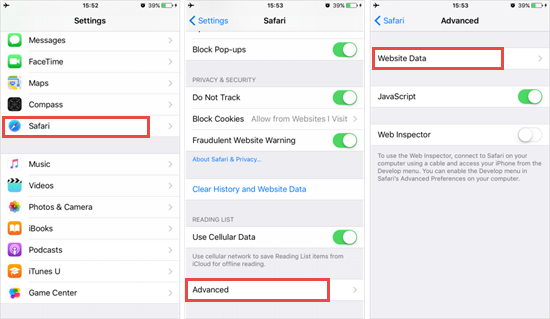 Like other web browsers, Safari for iOS stores the browsing history inside its bookmarks. In some cases, you need to check deleted history on iPhone or iPad: ensure your teenage son is visiting healthy websites; see what your partner is viewing; or call up the web pages you previously visited. Here are three basic methods you can choose to find and recover deleted Safari history/bookmarks on iPhone, iPad and iPod Touch. There is a little trick to check the deleted website domain name of Safari history. Find and tap on ‘Settings’ on iPhone/iPad/iPod touch. Scroll down and locate ‘Safari’ and tap on it. Go to the bottom and click on the ‘Advanced’ tab. Click on ‘Website Data’ in the next section to view some of the deleted browser history that is listed there. Note: This won’t work if the users clear out their cookies, data and cache or they use incognito mode. iCloud allows you to sync and store data with your iPhone/iPad, including Safari bookmarks/history. Supposed that you’ve merged your Safari data with iCloud before, it can be easy to restore deleted or lost Safari bookmarks as well as history from iCloud. Scroll down and Click ‘Restore Bookmarks’ under the Advanced. Select an archive of bookmarks to restore and Click ‘Restore’ again in the new information popup. Note: You can only restore the bookmarks if they are deleted within the last 30 days. As for the most recently deleted history/bookmarks, it’s better to use iPhone Safari History software. 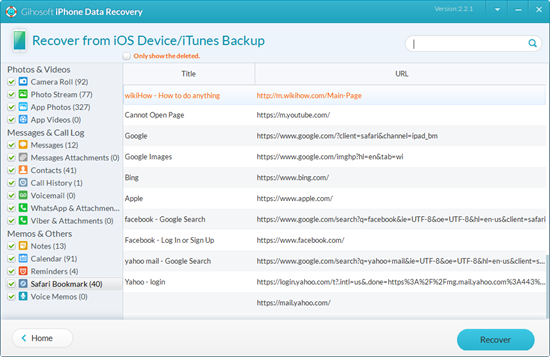 Free iPhone Recovery is such a useful utility that allows you to find and recover deleted history or bookmarks on iPhone/iPad/iPod touch, even if the user cleared out all the history on Safari. Step 1. Download & run iPhone Recovery tool and select ‘safari Bookmarks’. Step 2. Connect iPhone/iPad to computer, then start to scan for deleted bookmarks and cleared browsing history. Step 3. View and recover the deleted history/bookmarks on iPhone or iPad with detailed Title and URL. You can also print your iPhone/iPad history/bookmarks on computer.